You Can Begin Healing Yourself in a Totally New Way! A NEVER BEFORE REVEALED "SECRET"
BY REALLY PAYING ATTENTION TO WHAT I AM ABOUT TO REVEAL TO YOU, YOU ARE GOING TO LEARN A "SECRET" ABOUT HEALING THAT YOUR MOTHER, YOUR DOCTOR, YOUR PSYCHIATRIST, YOUR CHIROPRACTOR, YOUR ALTERNATIVE PRACTITIONER, YOUR PRIEST, YOUR RABBI, YOUR THERAPIST, AND YOUR BEST FRIEND COULD NEVER TELL YOU! THEY COULDN'T TELL YOU ABOUT THE INCREDIBLE INFLUENCE OF THE FUTURE ON YOUR HEALTH BECAUSE THEY DON'T KNOW THIS INFORMATION THAT YOU'RE GOING TO LEARN HERE... BECAUSE I DEVELOPED THIS KNOWLEDGE... IN FACT, IF YOU LEAN IN CLOSE AND LET ME TELL YOU ANOTHER LITTLE "SECRET"... ONCE YOU LEARN ABOUT THIS FUTUREVISIONING PROCESS, YOU ARE GOING TO BE ABLE TO GO BACK TO THOSE "AUTHORITIES" AND EXPLAIN TO THEM WHY ALL THE HELP THEY GAVE YOU DIDN'T FULLY WORK! YOU'RE GOING TO LEARN THE CRITICAL MISSING PEICES THAT THEY COULDN'T GIVE YOU AND, IF YOU WANT TO, YOU CAN EVEN TEACH THEM THESE POWERFUL IDEAS AND IT WILL IMPROVE THEIR LIVES PROFOUNDLY! IF YOU HAVE BEEN DEALING WITH ILLNESSES OR EMOTIONAL PROBLEMS LIKE MANY PEOPLE TODAY, YOU UNDOUBTEDLY FEEL ANGRY AND FRUSTRATED. MOST OF MY CLIENTS HAVE SPENT YEARS SEARCHING FOR SOME REAL ANSWERS AND REAL HEALING, AND THEY HAVE EXHAUSTED THEMSELVES TRYING EVERYTHING THE DOCTORS, THERAPISTS, ALTERNATIVE PRACTIONERS AND BOOKS HAVE TO OFFER, AND THEY ARE STILL PLAGUED WITH PHYSICAL AND EMOTIONAL PROBLEMS. SO IF YOU ARE FRUSTRATED... WELCOME... YOU'VE COME TO THE RIGHT PLACE, AND I PROMISE YOU, THIS IS NOT GOING TO BE THE SAME OLD INFORMATION YOU'VE GOTTEN EVERYWHERE ELSE. THIS IS UNIQUE, THIS IS NEW, THIS IS POWERFUL, THIS WORKS! I KNOW BECAUSE 26 YEARS AGO I SAVED MY OWN LIFE WITH THE VERY SAME INFORMATION I'M GOING TO GIVE YOU! MOST OF MY CLIENTS HAVE GOTTEN MORE REAL CHANGE FROM THIS INFORMATION IN A FEW WEEKS OR MONTHS, THAN FROM ALL THE YEARS OF MEDICAL TREATMENTS AND THERAPY THAT THEY HAVE BEEN THROUGH BEFORE. THIS IS POWERFUL INFORMATION YOU ARE GOING TO GET HERE... SO POWERFUL THAT I HAVE HELPED CLIENTS HEAL EVERY KIND OF ILLNESS THAT EXISTS; FROM PMS TO MIGRAINES, MENOPAUSE TO FIBROMYALGIA, FEARS AND ANXIETY ATTACKS, CHRONIC FATIGUE AND EVEN CANCER! So the first step of any process, especially a healing journey, is to figure out where you want to go. Unfortunately, most people do not have a clear vision of their future, and THAT IS THE SINGLE BIGGEST SOURCE OF STRESS, ANXIETY AND ILLNESS IN THEIR LIVES!!!. Doctors themselves say that 80% to 90% of all illness is caused by stress. FutureVisioning™ is a revolutionary healing process that empowers you to DESIGN AND CREATE THE LIFE THAT YOU REALLY WANT. This is the INVISIBLE KEY to healing physical, mental and emotional dis-ease! DISCOVER "THE POWER OF THE FUTURE!" Good! Now notice how you felt... Could you feel your body begin to relax even while you were reading that sentence, before you even did the exercise? Did you take a deeper breath? :-) And then as you were driving on that beautiful road could you feel the ease, the relaxation, a sense of spaciousness and safety? A feeling of hope? Did you notice how your shoulders relaxed... What other positive sensations did you feel? AND here is an important observation, did you notice that you felt happier and more enthusiastic? YOU JUST EXPERIENCED THE POWER OF THE FUTURE! Now really pay attention to this next statement. You just went from stressed, scared and holding your breath.... to relaxed, breathing and happy, in a matter of seconds, AND ALL YOU DID WAS CHANGE YOUR FUTURE!!! Anxiety and dis-ease and hope and excitement are all felt in the present, but they are primarily a result of your relationship with your future. This is the huge secret that the medical and psychological models of today do not understand! My client Lara suffered with physical problems and anxiety issues for 13 years and then they turned into horrible "terror attacks" for the last two years before she found me. 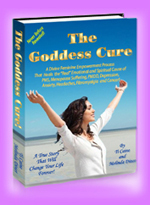 She had been to dozens of doctors and therapists, taken every kind of drug form pain killers to anxiety and anti depressants, she tried acupuncture and energetic healing, several different diets, vitamins and herbs did nothing for her intestinal problems and her panic attacks had turned to terror attacks. She could not even think of going anywhere on an airplane, and , in fact, couldn't drive more that 10 miles from her nome without freaking out etc., etc. Nothing had helped, and yet just by just doing these exercises and understanding that her anxiety was a normal reaction to the dark future she was imagining for herself, she totally healed her panic attacks during our first conversation, before we ever did a full FutureVisioning Session. Not everyone manifests full blown panic or anxiety attacks like she did, but everyone is affected by "stress." And the biggest source of stress in our lives is our unhealthy, undefined, foggy, scary relationship with our future! Most people thinnk that their biggest problems come from their past, but, as you have experienced the biggest influence on us comes from the future! People who are scared of their future usually call themselves "stressed" and their immune system gets worn out from constantly being on guard. Then they get sick, and when they get sick, they tend to focus on their illness and whether the dis-ease is physical, emotional or mental, it tends to grab their attention and their future gets even darker. 1. Imagining and connecting with a bright inspiring future is the source of enthusiasm and the core of every healing process. Having an exciting and inspiring future literally gives us a reason to live. Recent studies have shown that people who do not have a bright outlook on their future not only are sicker but they also die sooner. On the other hand many studies have shown that people who are excited about their future, live longer and are Healthy and Happy! 2. FutureVisioning™ is fundamental to all healing because having real hope for the future literally creates the motivation clean out the baggage and to process and heal the wounds, the fears and the blockages that are in the reate dis-ease. The future provides the blueprint for how to live a healthy an happy life. The FutureVisioning process includes very powerful and unique processes not just to cope with the old issues, but to go into the past and actually heal the wounds, the fears and the negative beliefs. 3. FutureVisioning™ also provides the energy and enthusiasm that creates new attitudes and behaviors that actually generate and maintain health and happiness and success. 4. By learning to create the future that you want, you can literally create a future where you enjoy vibrant health. Through the FutureVisioning™ process, virtually every kind of illness that exists has been healed. This includes: Chronic fatigue syndrome, PMS, migraines, fears and phobias, allergies, panic attacks, depression, generalized anxiety, constipation, excessive worrying, cancer, vertigo, acne, sleeping problems, weight loss, back pain, smoking, asthma, fear of public speaking, low self-esteem, relationship problems, parent and child difficulties, communication problems, emotional difficulties, career change, lack of self-confidence, low self esteem, self-hate, lack of self-forgiveness and self-sabotage. Everyone has the ability to imagine the future, but relatively few people use that ability to consistently focus on their most exciting futures. The people who do are called optimists. Some optimists have learned to access the power within themselves to manifest their visions, and these people are not only happy and successful, but they tend to be physically and emotionally healthy also. Unfortunately, too many people have been taught that they are powerless. They feel that their life and their future is just going to happen to them and thus, they feel hopeless and angry all the time. They endlessly analyze the past, and without consciously being aware of it, they wind up using the power of their imagination to create clouded and often scary pictures of their future. The result is, they move through life as if they are on that dark and scary road, driving through fog, afraid that something bad is going to happen, feeling defensive and living in a constant state of anxiety. Those scary futures and negative expectations not only create illnesses but they also create problems and negative circumstances in their lives. Sadly, in our society these people are considered normal. They are called stressed-out, bi-polar, depressed, and they often use drugs like marijuana, cocaine, alcohol and various anti-depressants; and behaviors like smoking, workaholism and overeating to try to cover up their anxiety. The revolutionary discovery that is the core of the FutureVisioning™ healing process is that the greatest stress in our lives is not just the pain of our past, or the sadness or loneliness that we may be burdened by today, the more devastating source of stress and dis-ease that makes us sick, is the fear that in the future we will never get what we want! "WHAT WOULD YOUR IDEAL FUTURE LOOK LIKE?" OVER 90% OF THEM CAN NOT ANSWER THE QUESTION!!!! IT IS OFTEN SAID, "YOU CAN'T HIT A TARGET YOU CAN'T SEE!" SO, HOW CAN YOU ACHIEVE A GOAL IF YOU CAN'T SEE THE GOAL??? Then tragedies like September 11th, the War in Iraq, the economic crash and always lingering threats of Global Warming and the Sand since that tragedy, especially with the increased visibility of terrorism, most people's relationship with their future has become even more threatening. The collapse of the Twin Towers and the physical damage done by terrorists is horrendous ... but the collapse of people's futures is even more devastating. The collapse of hope, whether it happened as a result of many wounds in childhood, or whether it happened because of a particular traumatic event, leads to a numbness, depression and anxiety that can last for years. Because most medical, psychological and even alternative practitioners do not understand that the core of hopelessness and anxiety is due to an unhealthy relationship with the future, they can only cover up or treat the symptoms and never really heal the problem. This hopelessness and anxiety weakens the desire to live, and it has been proven that chronic fear and anxiety weakens our immune system and leads to illness. We can reclaim our power and a bright vision can be developed that can be a source of inspiration, motivation and power. FutureVisioning™ creates this healing and transformation in people's hearts and minds. It not only teaches people how to understand how their vision of the future is affecting them -- it actually teaches them how to design and create a wonderful future. A positive relationship with the future gives us hope, and it gives us a reason to live. It is the reason we get up in the morning, it determines how we spend our day, and it profoundly affects how peacefully we sleep at night. Our expectations for achieving what we really want physically, financially, emotionally and spiritually, influence how we feel every day. Our optimism and enthusiasm effects every single cell in our bodies and leads directly to a state of health. This relationship with the future is the most influential and important relationship in our entire lives. As we develop the power to create a brighter future, we begin to trust that we will live a fulfilling life ... and we immediately relax. We breathe easier and stress, anxiety and self-sabotage are immediately reduced, and often chronic tensions, illnesses and addictions disappear. We feel more peaceful, more centered and more enthusiastic. Our relationships work better and our day-to-day lives become less stressful and more intuitive. Decision making becomes more easier. We automatically avoid unproductive choices. Our joyful future acts like a giant magnet pulling us forward -- making each day flow more smoothly, more gracefully and more successfully. Ti Caine has been involved in the healing arts for over 30 years, and his unique understanding of the enormous power and influence of the future is what enables him to help so many people heal. He gets what the real problem is, and, therefore, can help you fix it. Many people who want to heal physical or emotional illnesses have spent years analyzing their past, treating their symptoms with medical and alternative techniques, and often years more trying to just accept and be in the "now," but they are still sick. When they encounter Ti and his revolutionary understanding of the impact of their relationship with their future, they frequently experience an instant reduction in their anxiety, because they finally understand where their real problem is ... the dysfunctional relationship with their future. With this understanding, it is quite common that their actual physical symptoms start healing immediately and usually resolve quite quickly. One of the main messages from illnesses is that we need to work on our ability to create a bright and exciting future in order to be enthusiastic, passionate and healthy in our lives. or better yet, if you are one of those who knows that this is what you have been looking for, pick up the phone and call (818)-995-0011. I have room for a few new private clients each month, so lets get you started on this incredible journey into your Ideal Life.